Why is it so hard to lose weight after 50? If you turned 50 today or ten years ago, and still wonder why it is so hard to lose weight after 50 , this post is for you. Anyone of us who has hit the milestone of 50 knows how that feels. You go to your doctor, he tells you that you are overweight or obese, have high cholesterol or high blood pressure and may be close to getting type 2 diabetes. You say, so what should I do? I have tried so many diets. How, you ask, how do I lose weight? He shrugs his shoulders and/or tells you to eat less. You probably already think that you do not eat so much, and you are right. It seems like yesterday that you were playing on your high school baseball or football team. Or maybe you did varsity tennis or swimming. The point is that you were able to play your sport. You were in shape and it was probably the fittest time of your life. What happened over the last 30 years? How did we go from being lean and strong to as toned as a bowl of jello? Where did all these layers of fat come from? Is there a simple, effective plan that can help you to lose weight and get back in shape, even though you are over 50? Why is it so hard to lose weight after 50? First of all, you do not move much. Since you got your first big time office job, you have been sitting – a lot. Think about your day. You sit at the breakfast table to have your morning coffee and muffin. Then, you get in your car or hop on a bus to commute to your job for a good thirty minutes to an hour. At the office, you sit for at least another eight hours if not more. By the end of your work day, you have already sat for a good 10 hours. And then, you go home. Back to sitting during the commute and you get home for dinner and sit some more. At the dinner table, where most Americans have their largest and longest meal. You sit at the dinner table and then go to the lazy boy or the couch. And sit some more watching tv while snacking. This is the first reason why it is so hard to lose weight after 50. By the age of 50, you have sat for many hours of many days during your life. Lack of movement is a big problem. In fact, scientists have coined the term sitting disease. Because of your lack of movement for so many years, your body is deconditioned. You have lost muscle tone. Your body burns less calories than the younger you that had more muscle. Sitting too much is one big reason why it is so hard to lose weight after 50. And now you know, that you must start moving if you want to get healthier. All you have to do is get up out of that chair that you love, and start walking. Go somewhere, take a walk, just start moving. You grew up on junk food, on convenience food. There are work and life demands. You are not a chef or do not have time to cook. Everything is a rush, to the office, to meet deadlines, to get home and even to catch that plane for vacation. There never seems to be enough time. Well, the processed food manufacturers have you covered. Because they have formulated thousands of manufactured food items to give you short bursts of energy while keeping you addicted to their product. When you were a kid, you could not see the effects of the processed foods on your body. But now that you are 50 or more, you see the results. And at this point, it is no joke. You are facing serious consequences if you do not learn how to lose weight and get back in shape. Even your doctor has told you the same. Not eating enough real food is a second reason why it is so hard to lose weight after 50. You do not need to blend shakes all day, count points or calories. But, you do have to start eating real food. Fruits, vegetables, whole grains, legumes and for emphasis, let's again say vegetables. There are even many vegetarians who do not eat many vegetables. They have plenty of soy based products, fake meats, breads, muffins, but where are the real fresh vegetables? The secrets of long term success in weight loss and body transformation are I hate to tell you: vegetables. Remember Swanson's Fried Chicken Dinner or Chicken Pot Pie? I do not know about you, but I literally grew up on them. By the age of 50, many of us still think that the meat, chicken or fish is the main part of the meal. Yes, of course we all expect a few thin spears of asparagus with our steak, but that is to make the dish look good. Vegetables are not decorations, vegetables are your secret weapons to losing weight after 50, and getting fitter than you ever dreamed possible. Yes, those simple vegetables which are so neglected on most American tables. If you do not believe me, just eat mostly vegetables for a week and see what happens. Add a little healthy fat like avocado and olives, as well as some lean protein like fish, and just watch. You will get results, without starvation, without shakes or counting calories. So, next time you are in the supermarket, go to the vegetable section, and pick up a fresh vegetables like asparagus, bok choy, broccoli, zucchini, and make sure to have a lot with your dinner. You need to get into the habit of eating vegetables if you want to lose weight, get fit and really transform your body from fat to fit. And the fact that you are over 50, means nothing, it is just a bit harder to lose weight after 50 because of your habits which are ingrained. 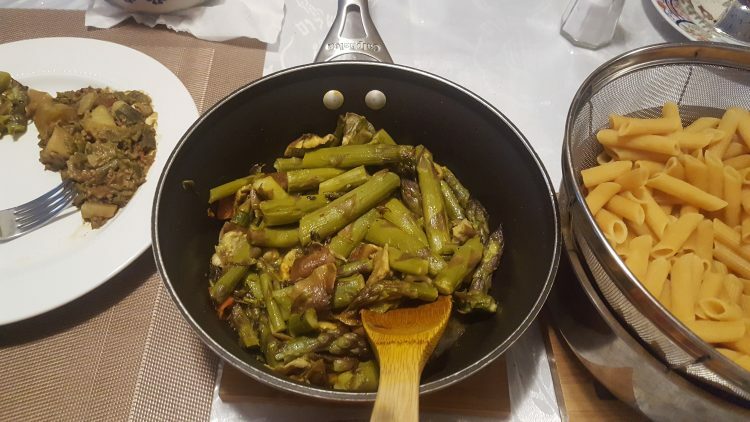 There is a super easy style of cooking vegetables which are referenced below in how to cook asparagus on the stove Nepali style. You can use this same method for just about any other green vegetable out there. Why is it so hard to lose weight after 50 ? Here is a hint – How often do you eat a lot of vegetables every day? Does this answer your question why is it so hard to lose weight after 50? Why do you think it is so hard to lose weight after 50? Click here for a simple high cholesterol diet and exercise plan.Are you ready to try a simple and effective plan to lose weight and get fit over 50? Start the plan for free…just sign up below and get the Hashi Mashi plan, and you will see results!